A new collaboration between a local business and the Summit School District that could land future graduates careers as the next generation of software engineers in Silicon Valley, financial analysts on Wall Street or rocket scientists at NASA is quickly taking off. For the founders of the program, filling this digital deficiency in instruction for grade schoolers was an obvious need. STEM — the acronym for science, technology, engineering and math — has become a greater area of emphasis for the district under its Vision 2020 strategic plan to improve how students problem solve and think critically. Working with EVO3, a community office space geared toward the tech industry for remote workers, was a natural fit, with Hansen acting as a co-founder of its nonprofit arm for precisely such ventures. Labeled the “500 kids in 500 days” coding project, with its goal of acquainting that number of local children to the subject in the next year and a half, the early results of the program are clear. 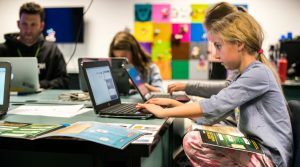 Using Bitsbox, a coding curriculum based out of Boulder and geared specifically toward children, students quickly learn the importance of proper spelling, typing and applications of math to design games centered around spy, zoo and dinosaur themes. Often the reward for successfully keying in the correct workbook data on the provided laptop is a playable game or app that brings feelings of accomplishment, as well as a smile. Helping overcome potential stigma of those who opt for an alternate path other than college — perhaps deciding on a trade school rather than attending a conventional university — is another element of the partnership. Whichever path an individual chooses, the hope is these kids do so with a unique approach and a different perspective, given their training. Last year with the pilot club, Frisco second graders worked with actual clients. They spent time producing functioning prototypes before presenting them for everything from how to keep wildlife out of trash receptacles, improve signage for Colorado Parks and Wildlife, and how the Frisco Adventure Park might add a new inner tube sliding hill. Summit Cove principal Crystal Miller agreed, and it wasn’t long before the school was bussing over fourth and fifth graders to EVO3 for an hour-long introductory lesson. Experts in the coding field have also held three supplementary sessions in October at the school, and now students are in the design phase until they exhibit their work at a final session in front of their families in mid-November. Having already served about 200 kids in the district, EVO3 has also received inquiries from other elementaries in the district, including Dillon Valley, and is quickly nearing 80 percent of its target number for the “500 kids” project. Current projections show the collaboration may hit its mark in just six months. From there — be it the present-day or future technology, space or financial hubs of the United States and world — it’s anyone’s guess where it may take these skilled coding prodigies next. For more information about the EVO3 Foundation, visit evo3foundation.org.